After years of tinkering with new gameplay modes and physics engines and all their other hocus-pocus and mumbo-jumbo, EA Sports has delivered the goods in what will most likely be their last “real” on current generation consoles. Although the game has its blemishes, the additional gameplay modes and various other do-hickeys hit the spot and deliver what could be considered the best football game this console generation. 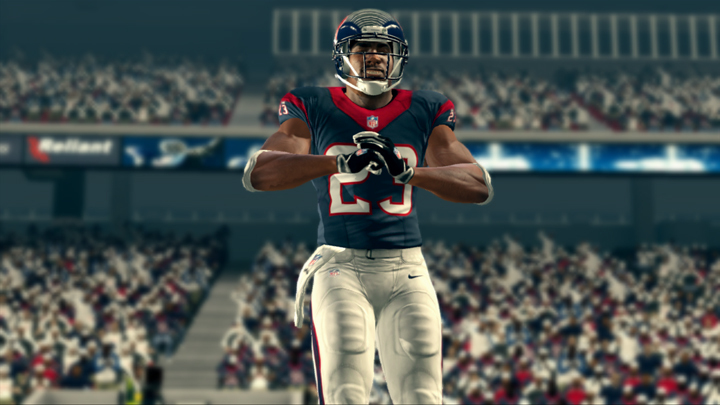 While graphically it may be the difficult to tell the difference between “Madden NFL 25” and last year’s version, the animations are a dead giveaway that serious personal enhancement surgery occurred with the Infinity 2 Engine. Players move better and respond with more fluidity to button controls than ever before. Add in the addition 30 running moves with Run Free Precision Modifier and “Madden NFL 25” features the best ground game since, well, the days of the 2K football games. The same thing can be said for the game’s presentation. Phil Simms and Jim Nantz provide excellent commentary that is full of witty insight and educated comments. For the first time in a long time, the pace and feel of a Madden game feels pretty damn close to a real NFL game. On these facets alone “Madden NFL 25” is a huge upgrade over its predecessor. The upgrades in the Connected Franchise mode and new Owner Mode, although thin in long-term appeal, are a nice distraction as well, with plenty of little odes to the tender love and care EA is known for in their games. Speaking of love, Ultimate Team is back and as always, is a joy to behold. Intuitive and easy to get into, players can essentially spend dozens of hours in the mode, forgetting that there is a Play Now and Season mode. Creating your own team is easy and trying to manage chemistry and turn a rag tag group of pros into a winner is super enthralling. With so many extra modes that captivate, “Madden NFL 25” is like a football all-you-can-eat. There’s just way too much to do- in the best way possible. At the same time, it’s the smaller things that hurt the game. Repetitive touchdown celebrations and shoddy instant replay camera work puts a blemish on a game that provides so many cool options. One big problem is the implementation of the right analog to perform “Heat Seeker” tackles. Supposed to balance out the gameplay addition stemming from the Precision Modifers in the run game, they don’t work nearly as well. Simply put, if someone knows what they’re doing and has the ball, the run-game modifiers will leave you in the dust. The same can’t be said for the tackling updates. While the animations are smooth and work well when they do, it’s more of an all risk and reward mechanic and not something you can depend on to make key tackles. The end result is a more offensive-based game that needs some more leveling out moving forward. But regardless of the few minor issues, the core gameplay of “Madden NFL 25” is a step in the right direction. The additions to the running game and chock-full of depth Ultimate Team mode more than make up for a tackling system that isn’t as solid as it should be. While “Madden NFL 25” isn’t perfect, it converts far more third and longs than you might expect. Pigskin enthusiasts might not be blown away on their first few possessions, but will realize after a few games that the added polish and animations ensure its place among the top football games of this generation. Watch the Review Fix and Brooklyn Video Games’ Retro Wrestling Mayhem Finals!